After the surprised seafood congee cooked by my wild boar Daddy, I thought I will reciprocate and cook something nice for wild boar Daddy :p Found some medium sized shrimps in the freezer and with one salted duck egg , some curry leaves from the side garden and tada in the shortest time ever , I managed to whip up this artery clogging dish good enough the serve the Lordship :p The aroma of this decadent dish lingers on into my dreamland…hhmmm that good! Ask the wild boar..ooops Daddy I mean if you don’t believe me :p This is a great dish to serve when you have invited guests to dinner. The salted duck yolk is the killer but we don't take it often so it is okay to indulge once in a blue moon. It does make the whole dish special. The aroma of the mashed yolk being sauted was great. Coating the shrimps shells was tongue licking good...haha I have no words to describe the estactic joy tasting this delicious, so tongue be it. Honestly the most important ingredient in this dish is the salted egg yolk. I can have the whole plate of shrimp delights all to myself and not wanting to share with anyone but I can't coz of the killer salted duck yolk . I love salted duck egg and I must not have too many in the house or I will kick the bucket sooner lol! Just kidding..my wild boar Daddy and the piggies will keep an eye on this. I am only allowed to buy two each time . look! how good those mashed killer are..
.....lusciously mouth-watering and the aroma hmmmm...great! Ooooh....prawns....my fvaourite. Must be so awesome with salted duck yolk. Sinful stuff but love it! WOW! This one looks so appetizing!! Delicious! My gosh, that looks so wicked and delish!!! 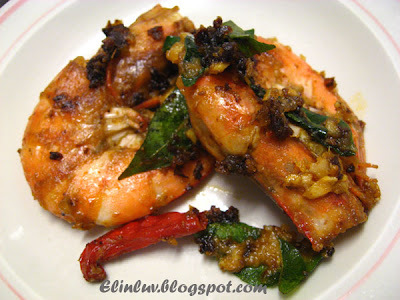 WOW Elin, I'm going to buy prawns again. 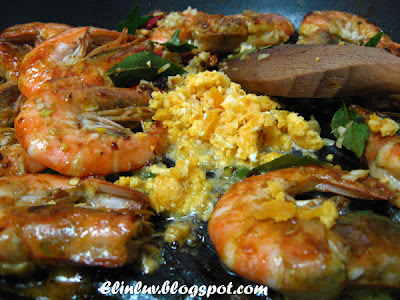 I read a book recently also use salted duck egg to cook prawns, thought of cooking it soon. 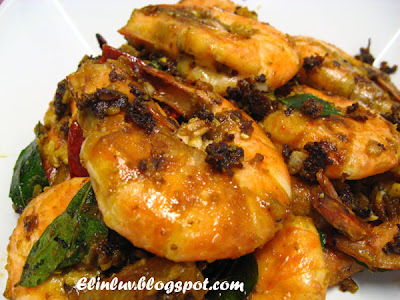 I think this recipe is much better than the plain salted egg prawn! Last X'mas, I went to visit my brother in S'pore. And we ordered that for lunch. Em..em...not as good as I expected! I'm not sure if it's because of the way they cook it or not, you know! Truly dissappointed. This looks so so yummy!!! I love the recipe!! This dish made me salivated! HI Mary...haha ya I know you love shrimps. Do try it out with the salted duck yolk. It is fantastic! 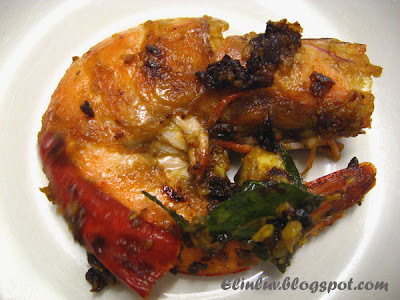 Hi Kristy...this method is more savoury and appetizing...do try it out and you will not want to have it in restaurant anywhere...lol! Just kidding this is good and I am sure elsewhere is good too. Hi Joslynn...great to have you here:) How are you keeping? Must meet up again one day when I am in KL :)) Meanwhile do take care till we meet again.